So you wanna know about the next storm, eh? Well, so do I! This next storm is complicated and will come in waves. Although I’m not a fan of giving potential snow or ice accumulations this far out, I can tell you that the trend has been colder and snowier today, but it is tricky! MODIS RGB Air Mass image valid at 1032 UTC on 02/28/14. This beautiful storm that is moving into California with mountain snows, heavy coastal rains, and even strong thunderstorms. I know I’ve heard a saying that goes something like: “thunderstorms in LA, snow to follow in the Mid-Atlantic and Northeast”. Maybe I’m making this up? Anyway, the early word is that we will go from a milder weekend with temperatures from DC-Boston quite a bit warmer than today. Sunday afternoon/evening, the rain will begin in the DC-Baltimore area, but might be cold enough for winter precipitation farther north. Boston area will wait until Monday for all of this to begin and it should largely be snow. As the overnight settles in, so will much colder air from Philly on south with a transition to freezing rain and sleet. If today’s models are correct, a decent snowfall could then occur on Monday from DC-NJ. That’s all I’ll say for now, but I’ll try to update tomorrow. So, I know many of you may be wondering what I think about the upcoming storm. Plain and simple, someone is going to get rocked and others will be watching enviously from the sidelines. I’ll get right to the point here. It’s going to snow and snow hard for a time Wednesday night into early Thursday. Sometime on Thursday morning, areas along and east of I-95 from DC-Baltimore-Philadelphia-NYC-Boston will probably see some ice pellets and freezing rain or regular rain. Even those that change over to rain will eventually change back to snow. This is a dynamic system and the computer model simulations only add to the angst. We’ve heard this mantra before. . .if the storm is more offshore, more snow for areas east. If the storm is closer to land, then warm air may change snow to rain. Same story, different storm. 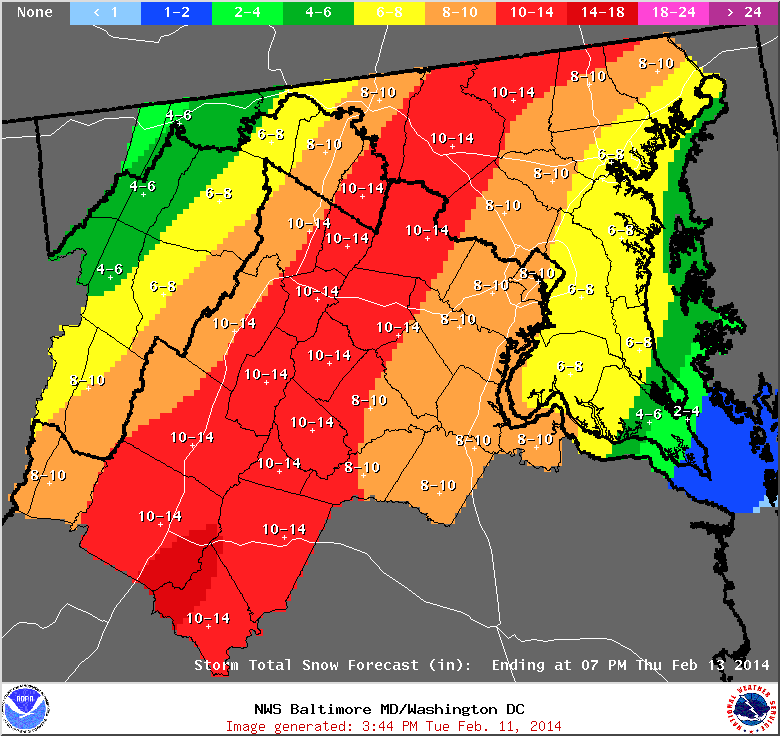 With that said, I am mostly in agreement with all the NWS office forecasts. The maps below are courtesy of the local National Weather Service offices. Wakefield NWS snowfall forecast as of 2/11/14. 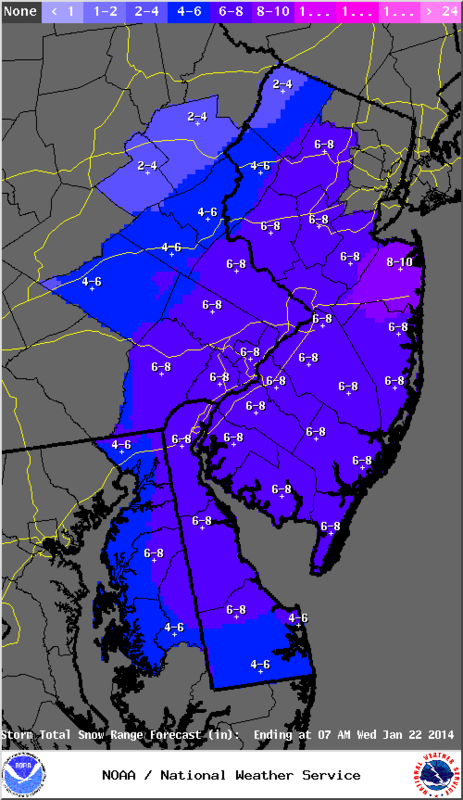 Sterling NWS snowfall forecast as of 2/11/14. Mt. 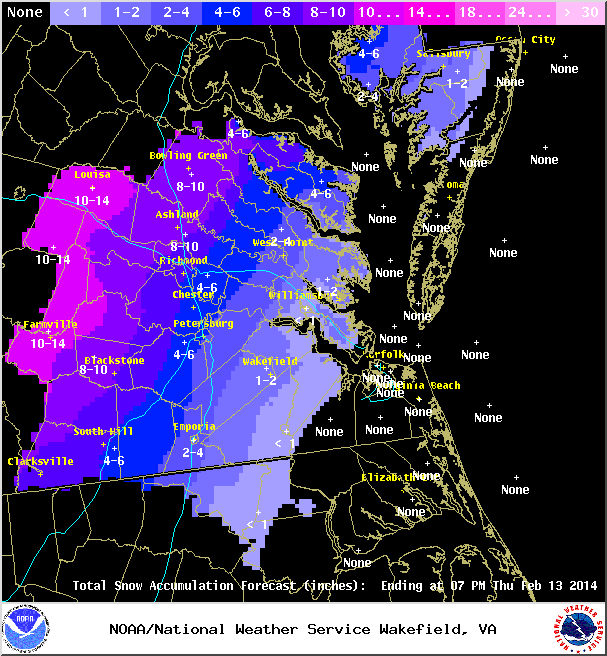 Holly NWS snowfall forecast as of 2/11/14. 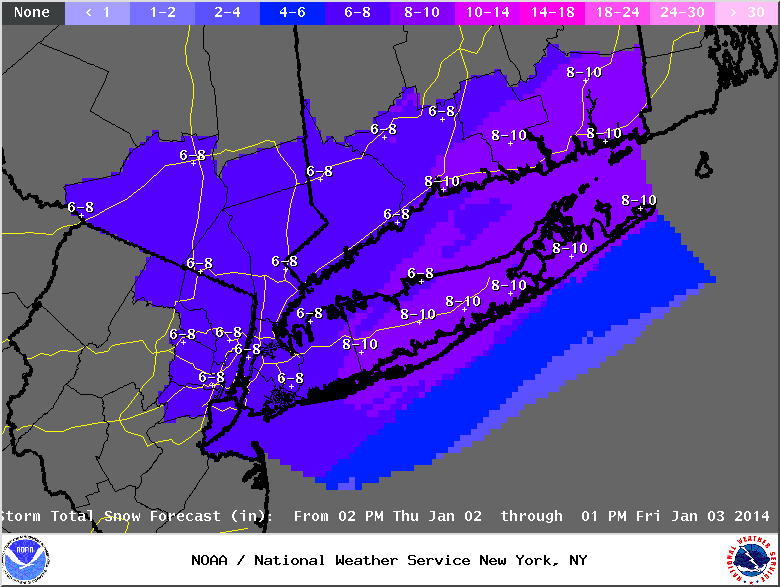 Islip NWS snowfall forecast as of 2/11/14. 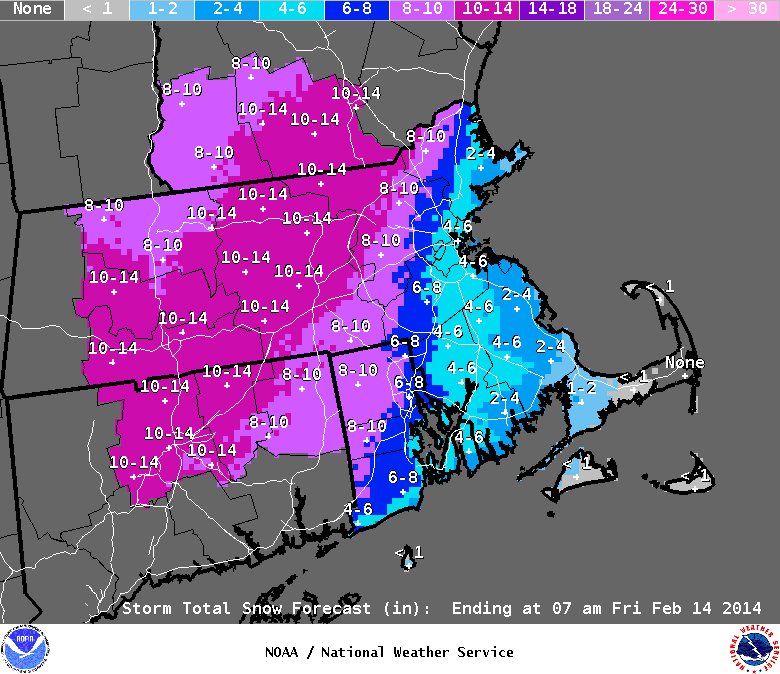 Taunton NWS snowfall forecast as of 2/11/14. Thanks for reading! I’ll update tomorrow if necessary. Could this be a big snow? I guess this depends on your definition of “big snow”. Considering I had my biggest snowfall on 1/3/14, since moving back to the East Coast, this may pass that one by. For most of my Mid-Atlantic to New England friends, this is a typical snowstorm that we just haven’t been able to get in the DC-Baltimore area for about 2-3 years. So, what happened in the last 24 hours to go from flurries to several inches of snow? GOES-13 water vapor valid at 0045 UTC on 01/21/14. 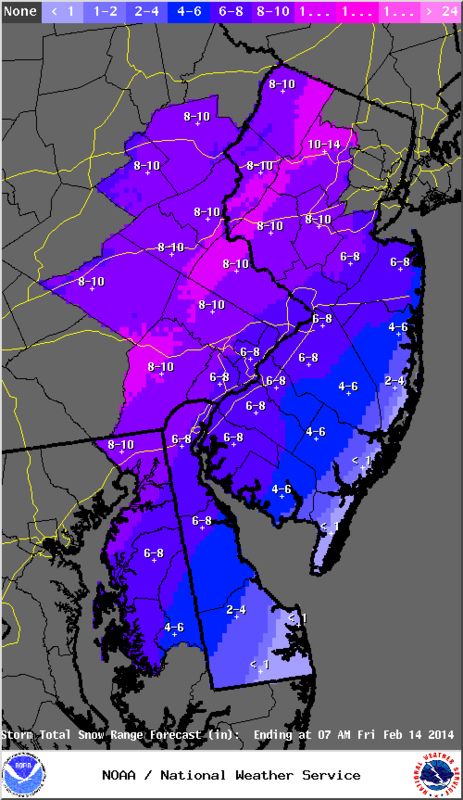 Philly-NJ: 6-8″ near Philly with coastal NJ coming in at 8-12″. Now this is an average, but someone could get a bit more than 12″. So, why the possible higher amounts? There will be localized bands of snow that may even contain some thunder and lightning. In these bands, you could get enhanced snow rates of 2″ or more. It’s very hard to predict this ahead of time and becomes more of a nowcast challenge. All areas will experience gusty winds (> 35 mph) in the late afternoon and overnight. The coastal areas could gust over 4o-50 mph!!! I would not be surprised to see at least coastal areas get upgraded to a blizzard warning, but it’ll be close. Then comes the cold. . .we will probably go 3-4 days without breaking the 32 F mark, so get ready! This pattern will continue to provide forecast challenges, so don’t be surprised if more snow chances pop up and surprise you! Sterling NWS snowfall forecast for 1/21/14. Mt. Holly NWS snowfall forecast for 1/21/14. 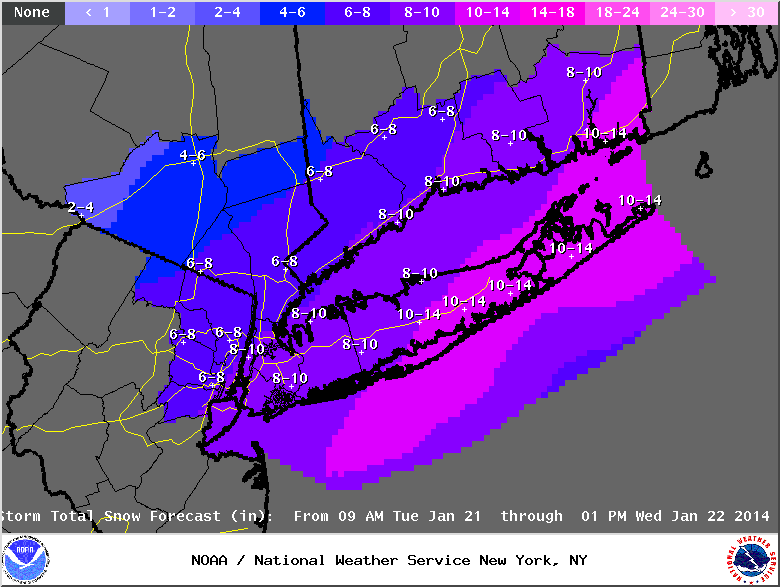 Islip NWS snowfall forecast for 1/21/14. 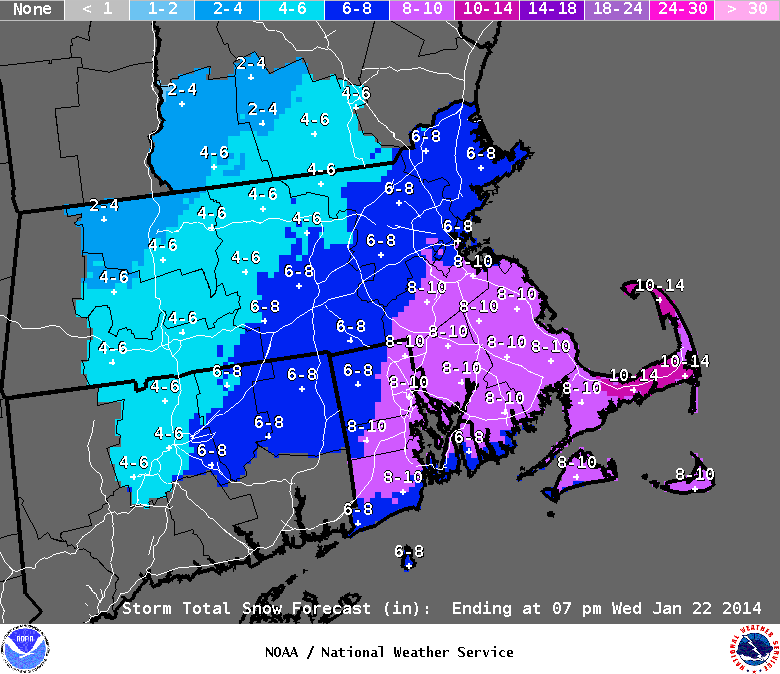 Taunton NWS snowfall forecast for 1/21/14. I will update tomorrow as necessary. And the storm has begun. . . So, the snow started here in Elkridge, MD about 3 hours earlier than expected. Since that time, I have measured 3.3″, which is above the 1″-2″ forecasted for my area. 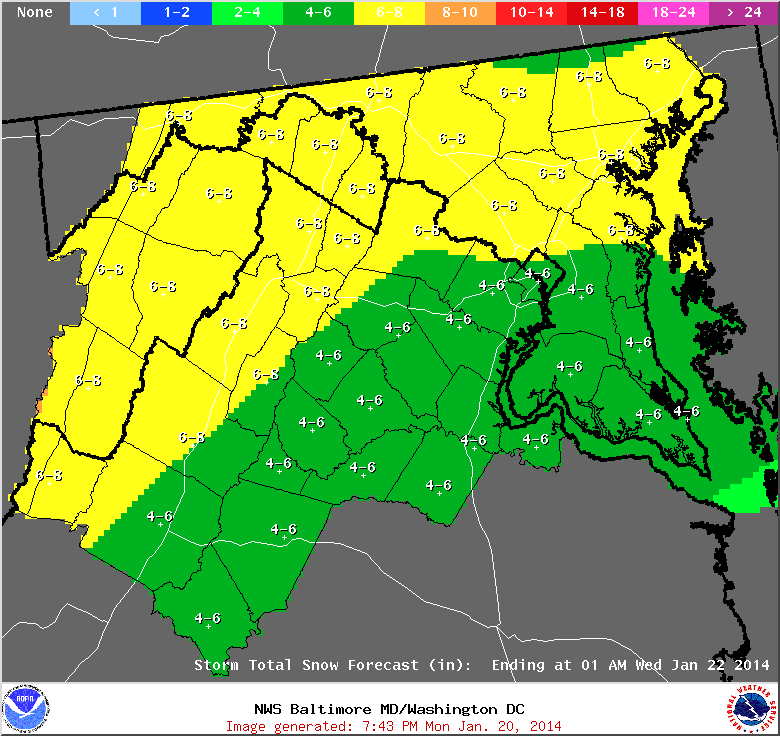 It looks like my 2″-4″ forecast for the Baltimore area is in jeopardy of being too low. We might end up with 3″-5″ total, but don’t be surprised if some places north and east get a bit more. 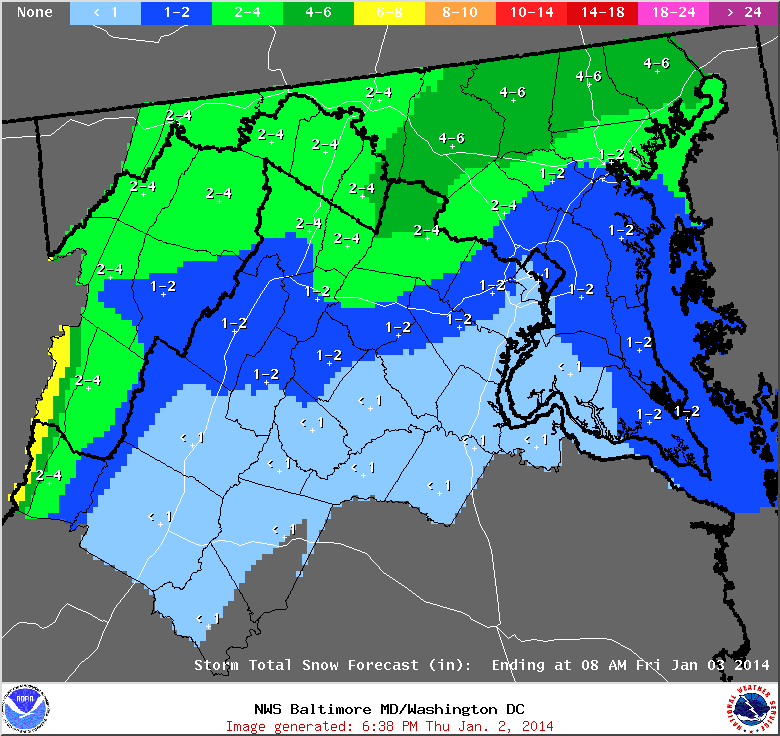 Sterling, VA NWS snowfall forecast valid for 1/2/14-1/3/14. 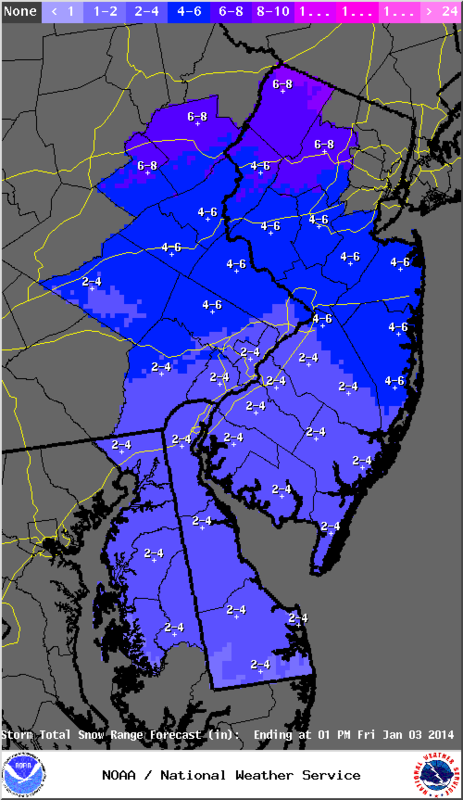 The above image is the Sterling National Weather Service snowfall forecast as of earlier this evening. The area along the I-95 corridor seems too low as we have already surpassed those numbers. Northeast of Baltimore appears to be in line for an easy 5″-7″. Expect winds to pick up overnight with gusts approaching 55-60 mph by daybreak. Blowing and drifting snow will be an issue tomorrow morning along with temperatures in the teens. As for NJ, my earlier upgrade on totals may need to go up yet again, but for now I’ll keep it at 8″-10″ near the coast with some spots getting closer to 12″. Blowing and drifting will become an issue as wind gusts increase to 50-60 mph into the early morning hours. Again, temperatures will be very cold in the morning, so be careful! The Mt. 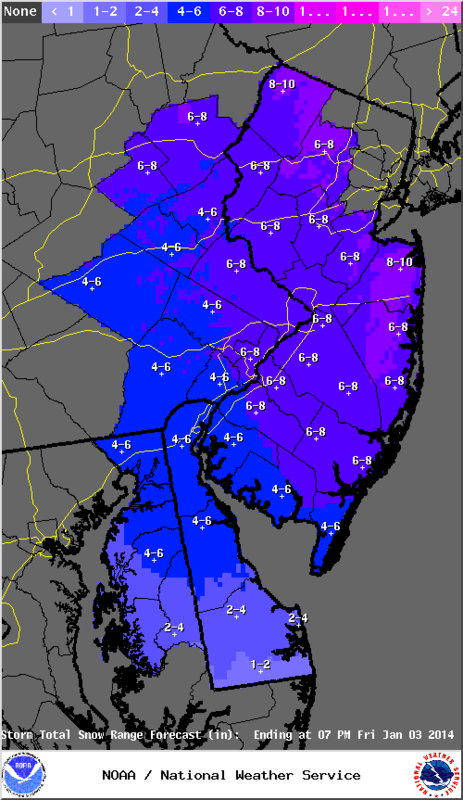 Holly, NJ NWS snowfall forecast valid for 1/2/14-1/3/14. The above snowfall map plays it out nicely and I see no reason to disagree with it. Again, closer to the coast there may be more than 12″ in spots. 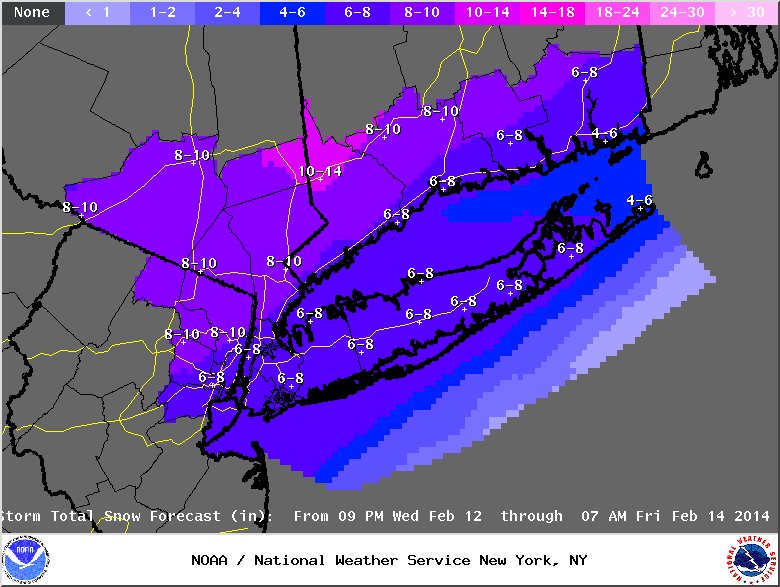 For northeast NJ, NYC, and Long Island, the totals on this map look good, though some areas might end up higher. This storm already appears to be exceeding my expectations and the main energy is just getting to the Appalachians west of the DC area. What keeps this storm from going wild is that there is no blocking near Greenland (or weak blocking at best). The big winner will most likely be the Boston area with 12″-18″. Special note: Temperatures on Saturday morning will be the coldest in years (at least since 2009 in many areas), so be aware. From DC-Baltimore up to NJ, temperatures may settle around 0-10F, but as you move farther north, below 0 temperatures are expected. I’ll update as needed on Facebook. 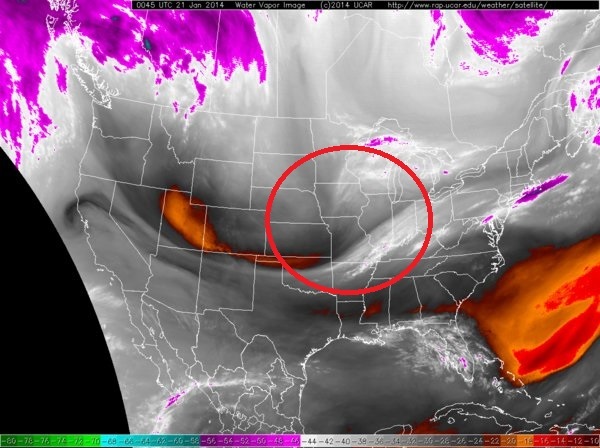 My next post may be over the weekend to talk about the next storm and even colder air mass. Stay safe and thanks for reading!!!! As 2013 comes to a close and 2014 dawns on us, Mother Nature appears to be in the spirit of throwing snow on some and blasting most of us with some very, very cold air. We have two power arctic outbreaks ahead of us, but I will focus on the first one this time and the other over the weekend. 1. The snow may start as rain from DC up through NYC and southern New England late on Thursday, but should quickly transition to all snow as the arctic air will be deep and moving east to join the first batch of precipitation. A second round of precipitation (mainly snow) will move in late Thursday night with more snow as you approach the coast. It will also get windy, if not very windy (near the coast) as the storm explosive strengthens. 2. My first guess on snow is as follows: DC 1″-2″, Baltimore 2″-3″, Philadelphia 3″-5″, coastal NJ (AC-south) 3″-5″, AC-north maybe closer to 5″-8″, NYC 6″-8″, with much more closer to Boston where some will get > 10″. 3. Winds could gust 35-45 mph, possibly higher near the coast. 4. It will get very cold with Friday highs barely reaching 25 for DC-Baltimore to around 20 farther north. Saturday morning lows should be interesting. If there is decent snow cover. . .some might get close to 0F. The first snowfall map from the Mt. Holly, NJ National Weather Service office is below. I’ll update as necessary. Mt. Holly NWS snowfall forecast from Thursday evening to Friday afternoon. Yesterday marked the end of meteorological summer which runs from 6/1-8/31. Technically, summer ends on or around 9/21 each year, but for meteorological records, June, July, and August (JJA) are considered the summer months. So how did this summer fare compared to others? It definitely ended much cooler than we have experienced over the last few years. I have also noticed that rainfall distribution became more sporadic as summer progressed. 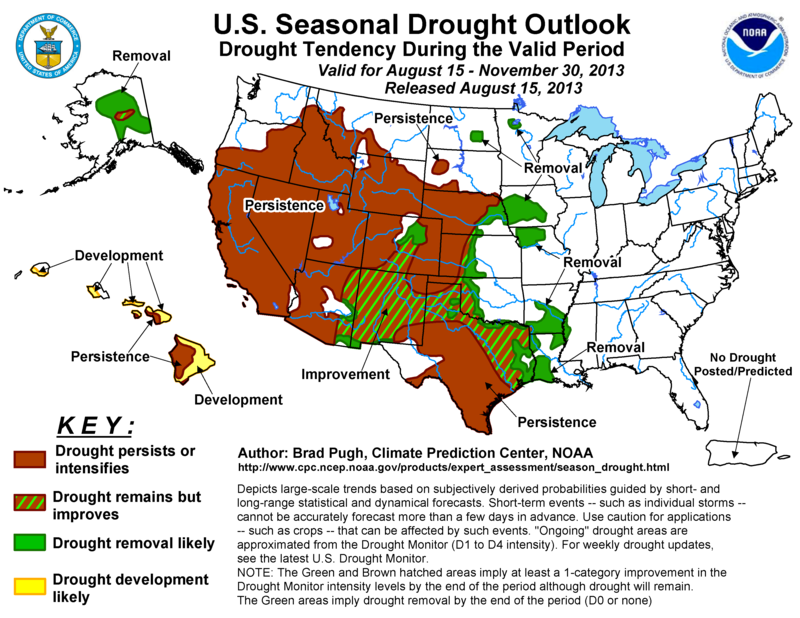 The great drought of 2012 has been eaten away some, but it slowly returning as we head towards typically drier months. And of course, there is the hurricane season or lack thereof. . . I will try to have a few other cities in a future post as I know this is a very small sample. From these five cities, average temperatures were slightly above normal, while precipitation was above normal in the East, but much below normal in the western Gulf Coast. Climate Prediction Center (CPC) Seasonal Temperature Forecast for September, October, and November (SON). CPC Seasonal Precipitation Forecast for SON. The Climate Prediction Center (CPC) issued their Fall 2013 forecast last month. As you can see from the first image, above normal temperatures are predicted for the Great Lakes, Northeast, and the Desert Southwest. The rest of the country is expected to be near normal. Precipitation is forecast to be above normal for Montana and the middle of the country, while the rest of the country is expected to be near normal. Now, late season tropical systems could certainly wreak havoc on this forecast, so keep that in mind. The Drought Monitor issued last Tuesday shows how drought conditions have spread east from the persistent drought areas (high plains, intermountain west) during the latter part of summer. Areas in the upper Mississippi Valley and along the western Gulf Coast have gotten progressively drier with time, but the Seasonal Drought Outlook issued on August 15th, shows these areas improving over the next few months. GOES-13 infrared imagery with 30-minute GLD-360 lightning density overlaid valid on 09/01/13 (click to animate). This area of disturbed weather heading towards the Caribbean will be of special interest over the next few days. I will focus more on the tropics in a future post, including some ideas on why this season has been so quiet. . .even globally! It’s been a while since I posted anything, so I thought I would take this tranquil time to advertise a project I have been working on (slowly) over the last few years. I am combing through all the tropical systems globally and providing detailed maps that show maximum strength, landfalls, and any other pertinent information. There are similar projects being done, but this is my personal version. Eventually, I may put this on Google maps, but for now I’m having fun. Click on any year and you get every single tropical system that developed in that year. As for our current tropical season, we remain in a rather distinct lull in global activity (Accumulated Cyclone Energy is less than 50% of normal for the date in the Northern Hemisphere) and there are no signs of a significant uptick in activity over the next couple of weeks. I expect to go through a couple burst periods in the Atlantic starting around mid-August. So, why has it been quiet? Well, the Atlantic has been particularly hostile so far (not very unusual), but as the seasons start to change, the Atlantic starts to get more favorable for development. Another culprit. . .look below! That bright orange and red area is a large SAL outbreak of dry, dusty air and this will keep things quiet for the upcoming week. These SAL events should be waning as we head into August, so don’t expect the quiet to last much longer. . .
Saharan Air Layer (SAL) product from CIMSS valid at 18z on 07/30/13. I will be recapping the 2013 hurricane season so far in an upcoming post. It seems we are continuing our string of exciting weather years across the country. This time, it’s the Mid-Atlantic’s turn, which makes sense as some of the most severe weather occurs in June. But, seriously. . .a tropical storm followed a couple days later by a string of weak tornadoes and torrential rain? Guess, what? We aren’t done yet! Baltimore has had 4.91″ for June, 18.77″ for the year which is 1.72″ below normal. Philadelphia has had 6.79″ for June, 19.32″ for the year which is 0.85″ below normal. Atlantic City has had 4.07″ for June, 21.63″ for the year which is 1.24″ above normal. Day 2 Convective Outlook from the Storm Prediction Center valid on 06/11/13. Day 3 Convective Outlook from the Storm Prediction Center valid on 06/11/13. Another round of severe weather will headed towards the Ohio Valley and Mid-Atlantic over the next 48 hours which could consist of high winds, more heavy rain, some hail, and possible tornadoes. Yesterday’s tornadoes received much attention as I’m sure many are a bit sensitive after the rough end of May. Then the word “derecho” made it back into the media vernacular in the last 24 hours to describe tomorrow into Thursday. While this is a possibility, these large thunderstorm complexes are very tough to forecast. I wouldn’t be surprised if there were multiple rounds of severe thunderstorms tomorrow afternoon into Thursday afternoon. There is much jet stream energy with a strong disturbance moving in from the upper Plains. This along with instability due to the strong June sun and nearly tropical air mass just to the south of the Mid-Atlantic could lead to very dangerous weather, so please take this seriously. As the Thursday wears on, the threat will slide south along the East Coast, possibly leading to isolated severe thunderstorms in the Carolinas back to Mississippi. The great news. . .the weekend looks very nice, especially on Saturday with some showers moving in later on Sunday. For my Louisiana fans: Hot and humid for a while with very low chances of rain. St. Louis: Hot tomorrow, with thunderstorms possible tomorrow night. This is a short post to keep my Mid-Atlantic friends updated on our first tropical storm of the 2013 season. This should NOT be a big deal for NJ, but more like a weak-moderate nor’easter heading into your Friday. There might be some wind gusts to 30-40 mph, but I think we can handle this. The bigger threat will be heavy rainfall and possible flash flooding. I’m sure the on-shore flow might cause some minor coastal issues, but this shouldn’t be a big problem. I have included the Weather Prediction Center (WPC) rainfall forecast for the next three days below. I have also included the latest National Hurricane Center (NHC) forecast track. WPC 48-hour rainfall forecast valid at 8 pm EDT on 06/06/13. The NHC track forecast for TS Andreavalid at 5 pm EDT on 06/06/13. As always, feel free to ask questions or leave comments.